Everybody loves little food. It’s a thing. Make a miniature version of something and it’s instantly a hit. Why? Maybe it’s the cute factor. Or maybe because there is less guilt associated with eating it. Or is it because people love trying lots of different things? Why commit to 1 slice of cheesecake when you can nibble on a whole variety of goodies instead! 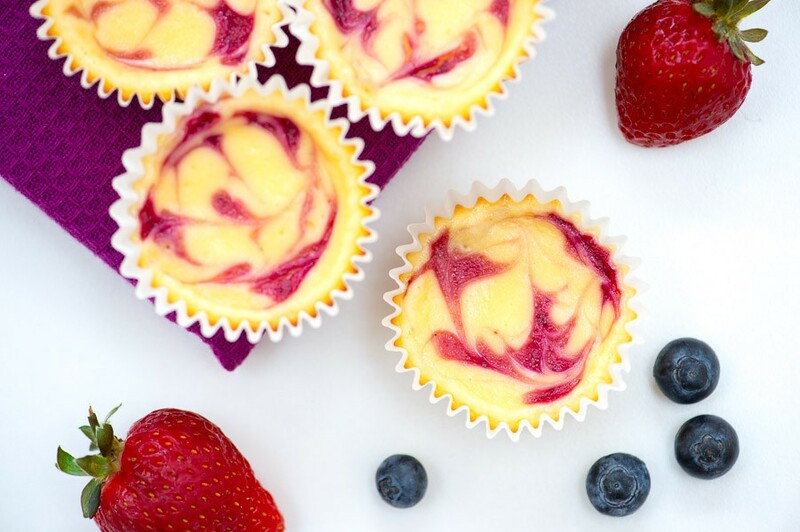 I made these little cheesecakes for a picnic and they worked perfectly. Having bite-size version’s means no need to slice and serve. No mess, no fuss! They are also fab if you are serving up a variety of little desserts at a dinner party, or need a sweet treat at a finger food buffet. The berry swirl looks impressive and it’s so simple to do. In fact, its really fun making the pretty patterns. Just play around and have fun with it! Use any berries or mixture of berries that you like. Preheat the oven to 180°C. Line a mini muffin tin with the cupcake wrappers. Crush the biscuits (either with a rolling pin or a food processor). Mix in the melted butter and sugar. Place about a teaspoon or so of the biscuit mixture into each cupcake liner, and press down. Bake for 5 minutes, then allow to cool. Leave the oven on for later! Meanwhile make the berry swirl. Add the berries, sugar and water to a blender or food processor and process until smooth. Pass the mixture through a sieve to remove any seeds. Set aside. For the filling, beat the cream cheese with an electric/stand mixer until smooth. Add the sour cream, sugar, lemon zest and vanilla essence and mix well. Beat in the flour, then lastly add the eggs one at a time and mix well. Divide the mixture equally between the cupcake liners, filling each about 80% of the way. Using a teaspoon (the smallest you have), drop about 5 drops of berry sauce (quite evenly spaced apart) onto each cheesecake, then use a toothpick to swirl the mixture around. Bake for 20-25 minutes then remove and allow to cool before serving. The cheesecakes will rise a bit and possibly crack, but they do sink again and any cracks that have formed won’t be visible. TIP: You’ll need to buy the mini cupcake wrappers from a baking store. I found that the 4cm diameter (at the base not the top) ones were just right. 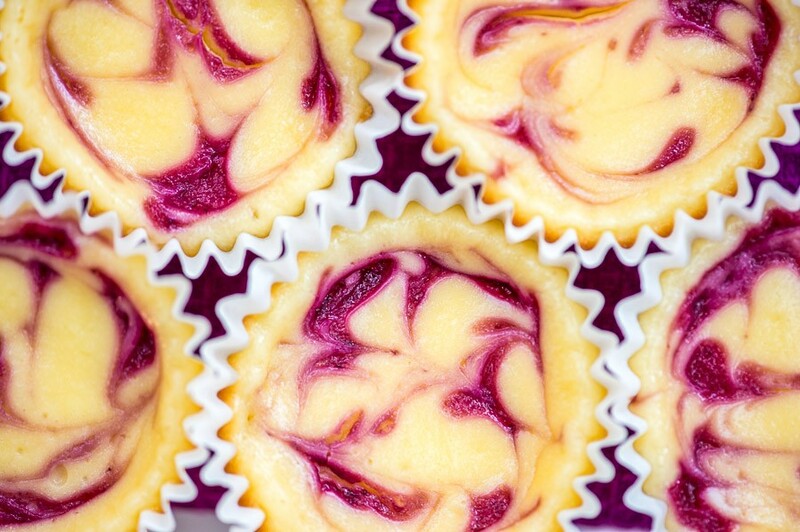 And go for white wrappers, as they go clear after baking and show off the mini cheesecakes nicely. These work best of you have a mini muffin tin. 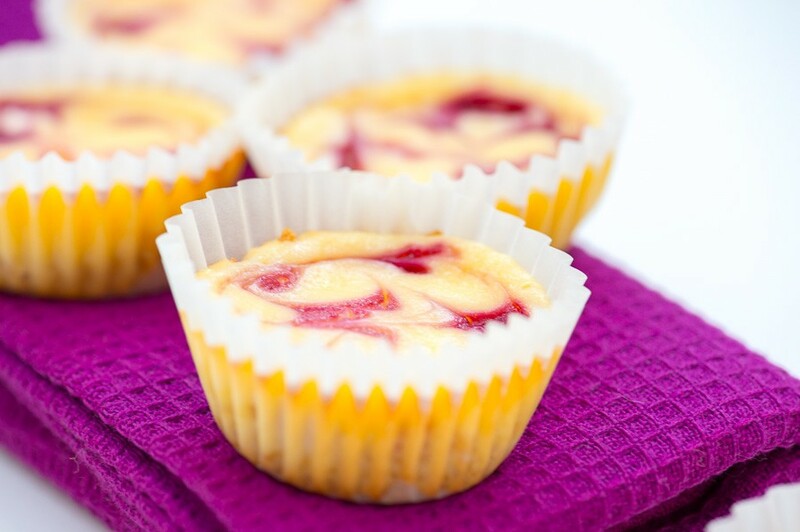 But if not, just place the small wrappers in a regular sized muffin tin – the cheesecakes will spread out a bit during baking and not be quite as compact. If you can’t be bothered to buy the mini cupcake wrappers, just use regular sized ones – you will get 12 cupcake size cheesecakes.